We are an experienced custom integrator of industrial control systems with experience in designing systems for fertilizer, chemical and seed measuring, using a combination of a standard line of products and custom automation. My business began in the 1980s as a side-project of my father’s electrician shop in Fairmont, MN, which primarily served our surrounding farm community. 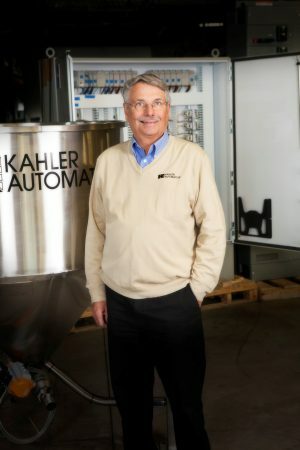 Now in its 25th year as Kahler Automation, we continue to develop new products and expand into new markets. My business is horizontally and vertically integrated into the agronomy world. We apply technology to help our partners manufacture, store, and distribute farm chemicals and fertilizers. We support the families and communities of more than 80 employees in rural southern Minnesota. Our partners are large and small farmers, cooperatives, farm chemical and fertilizer manufacturers, agronomy service providers, road and rail transportation businesses, agricultural equipment manufacturers, construction companies, and producers of food, fiber and fuel. Our hardware and software systems measure, blend and track agricultural products across the country and around the world. We’ve become a global player in industrial automation systems, grown from strong southern Minnesota ag roots.